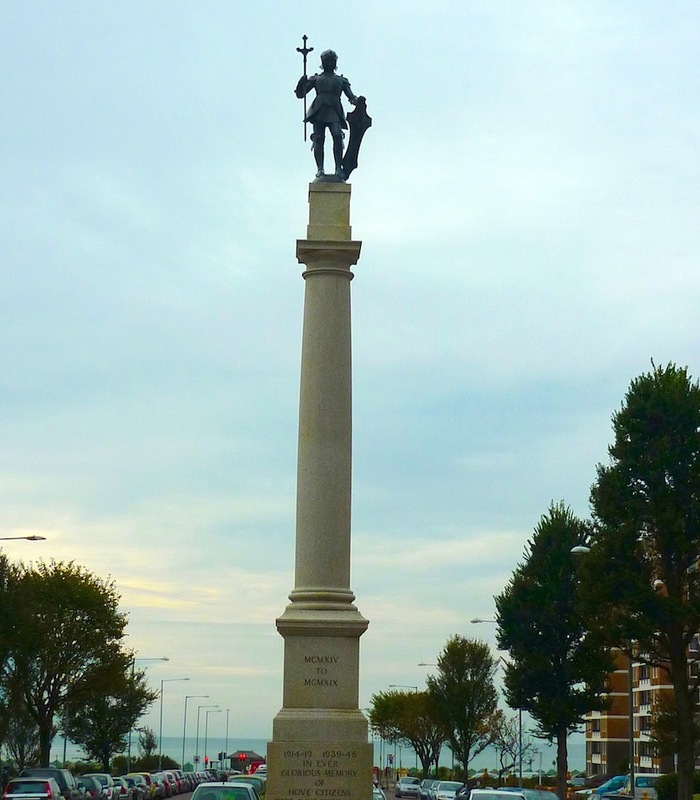 This war memorial overlooks the sea at Hove, Sussex, and is Grade II listed. It was designed by Sir Edwin Lutyens (1869-1944), and its unveiling on 27 February 1921 was reported in the Times of the following day. It acquired some additions after World War II. Constructed of grey granite, it is of special interest as a "rare Doric column memorial by Lutyens" (listing text). It is described in the same text as rising "from a square, two-stage plinth, itself set on a shallow three-stage square base," and as being altogether 10 metres tall. The inscriptions read: (North, as shown here): MCMXIV / TO / MCMXIX / 1914-19 1939-45 / IN EVER / GLORIOUS MEMORY / OF / HOVE CITIZENS / WHO GAVE THEIR LIVES/ FOR THEIR COUNTRY / IN THE/GREAT WAR / AND WORLD WAR; (East): MCMXXXIX / TO / MCMXLV; (South): MCMXIV / TO / MCMXIX / THEIR NAME / LIVETH / FOR EVERMORE; and (West): MCMXXXIX / TO / MCMXLV. The elegantly stepped base of the column, showing the inscription on the north aspect and the surrounding steps, including small granite bollards (now protected by larger ones with lights). 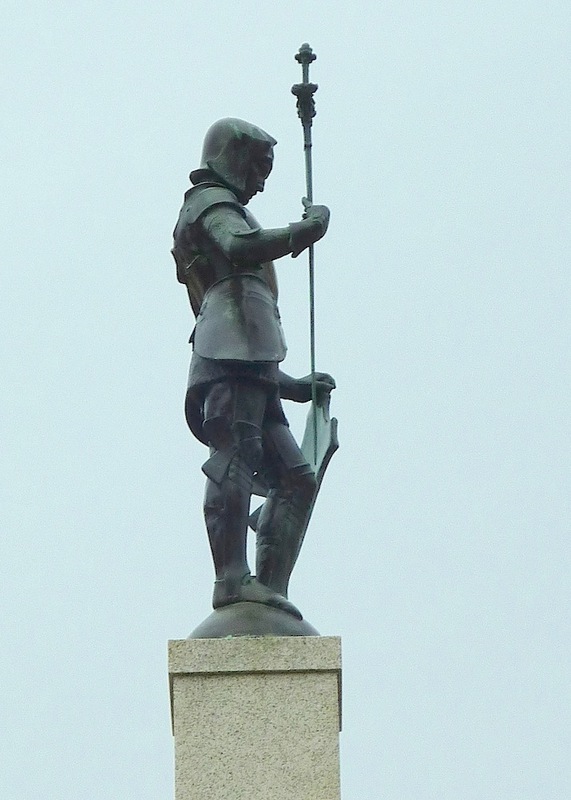 The bronze statue of St George at the top is by Sir George Frampton, and is similar in some respects to one shown in a 1904 issue of Academy Architecture and Architectural Review. The stone bollards at each corner are original, and form part of the whole memorial, which stands on a wide road called Grand Avenue, not only overlooking the sea but overlooking Sir Thomas Brock's statue of Queen Victoria a little nearer the sea. Its height is perfect for this setting, allowing it to be seen above Brock's work when looking up from the promenade. "Hove War Memorial." English Heritage. Web. 24 April 2018. "News in Brief: Hove War Memorial Unveiled." Times. 28 February 1921: 7. The Times Digital Archive. Web. 23 April 2018.